El Celler de la Boqueria (Cat. 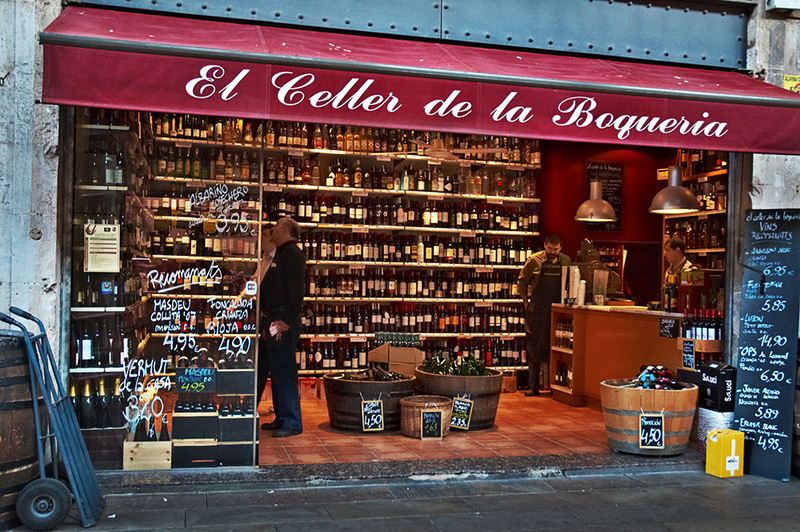 for cellar) is one of those small businesses surrounding La Boqueria stalls that you should bear in mind when visiting this famous Barcelona market. The place is run by the second generation in a family of wine connoisseurs with over 40 years experience. And I won't say more because I don't mean to advertise the shop but to sell the excellence of the Spanish and Catalan wines showcased in this beautiful corner of La Boqueria. Delicious photo! Do they have any specials on reds today? Like buy 6 bottles, get 2 free?! Cheers! Sante'! Prost! Skal! That is one beautiful shot! I love the way they designed and arranged their wines! Love that photo of a great shop. A little different from the bodega we popped into in Barcelona about thirty years ago to sample some wines. It's wonder we made it back to my friends with the baby still in the pushchair! A bit different than in Sweden, I can tell you that. We all have to buy our wine from the state owned Systembolaget. It's a great photo and shows how Barcelona & Spain still has so many individual shops rather than chain-stores.